INMED’s Health in Action program, which works to improve the health and nutritional status of children in nine Brazilian cities, won the 6th annual Ozires Silva Prize for Sustainable Entrepreneurship in the category of Entrepreneurship in Education. The program is implemented by INMED Brasil in partnership with Mondelēz International, with the support of local governments, to promote nutrition and hygiene education among children; train teachers, cafeteria workers and community health workers in health, nutrition and environmental education topics; and establish vegetable gardens, among other activities. The program is also supported by Johnson & Johnson, which donates deworming medicines for all of INMED’s programs in Brazil. The Health in Action team with the Ozires Silva prize. 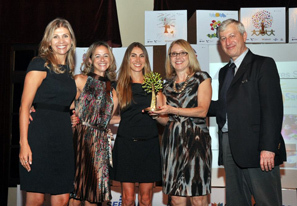 For Mondelēz Brasil’s coordinator of social responsibility, Giselle Sigel, the prize is meaningful as well. “It is a great honor to receive this recognition for a project that promotes improvements in the quality of life in the communities where it works,” she affirmed. Learn more about the 2013 Ozires Silva prize here. See page 17 for a video of the award recipients, including a statement from Dr. Capelli (beginning at 5:35). The Health in Action program, implemented by INMED Brasil and funded by the Mondelēz International Foundation, with the support of the municipal secretariats of Health, Education and Supply in each location, began in April 2010. The program diagnoses and treats intestinal parasitic infections and anemia, delivers nutrition and hygiene education, and builds school gardens for students in public schools. Currently, the program involves 120,000 children ages 5-14 in 435 schools in nine cities in Pernambuco, Paraná and São Paulo states, and has also reached approximately 540,000 family and community members through the program activities. At the national level, the Ozires Silva Prize is awarded in the categories of Economic, Environmental, Educational and Social Entrepreneurism. The Prize is an initiative of the Brazilian entity Instituto Superior de Administração e Economia do Mercosul (Isae-FGV), in partnership with the Grupo Paranaense de Comunicação (GRPCOM), SEBRAE-Paraná, and Itaipu Binacional. The patron of the Prize, aeronautical engineer and former president of Embraer, Ozires Silva, created it to recognize entrepreneurial initiatives in Brazil that thrive even in an environment that may be unfavorable to new businesses.